Commander Anthony David Merlin Williams (first to the left) was the son of my grandfather's sister Henriette Felbecker, married to David Gwynne Williams. I only have a few data of his life: he survived the sinking of the HMS Prince of Wales and he died in June, 1972. The Williams family and our family were separated by the war. If you have further information of his life (was he married, did he have children, his career after the war, where did he live), a short message from you would be highly appreciated. Thank you very much for your help and all the best from Germany. My Great Uncle, Alfred (Alfie) Ellis, from West Derby, Liverpool survived the Prince of Wales sinking and was captured by the Japanese and put into a POW camp. He was feed grains of rice and water and was beaten a lot especially in the front of the neck below the chin. When he came home he had to be fed baby food and liquids until he was built up again. I always remember his husky voice and then my gran told me the reason why. Alfie only passed away a few years ago although he never really spoke much about his ordeal. My late uncle, Albert Summergill, was a PO on HMS Prince of Wales and survived the sinking. I recall my grandmother telling me as a kid, that he and other survivors were on a ship - name unknown - that was taking them back to England when that was also attacked and sunk. After that I cannot remember the hows and when they all got back home. As a kid the war was recent history and people did not really talk about it much. My gran never liked talking about the war, but was one of the luck mums… her three sons all went through the war and came home. I wonder if your members have any information on the return journey of the Prince of Wales survivors to the UK. 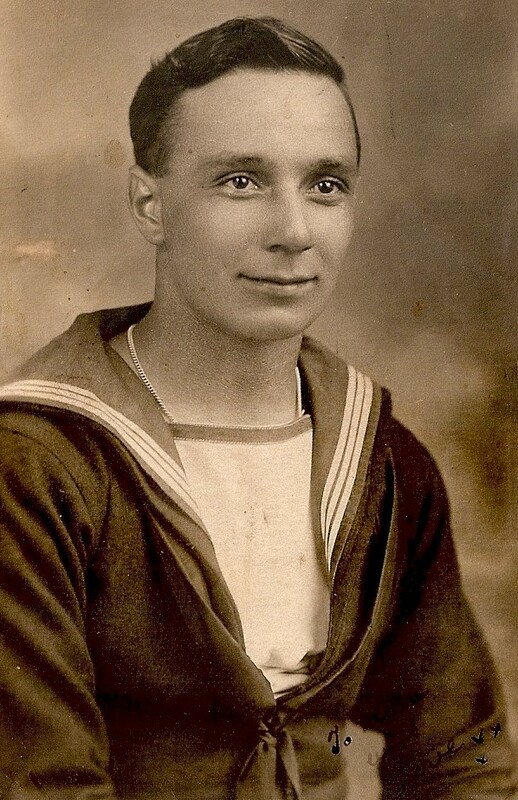 I came across your website and would like to post in the hope of learning something about my grandfather, Fred Goodliff, captured by the Japanese and held as a prisoner of war after the sinking of the Prince of Wales. Any help or advice you might give would be greatly appreciated. I noticed on you message board a reply from one of your subscribers about his father taking charge of POW survivors on there way back to the uk from Durban. Sadly my father Royal Marine Kenneth Lukehurst passed away some years ago and would never discuss details of how he got back from Durban. He was on the POW when she sunk in December 1941 and was in Singapore when if fell in 1942. He escaped with an officer I think on the march to Changi and ended up in South Africa. There are many holes in his story which I would love to fill. So if anyone can help I would be eternally grateful. 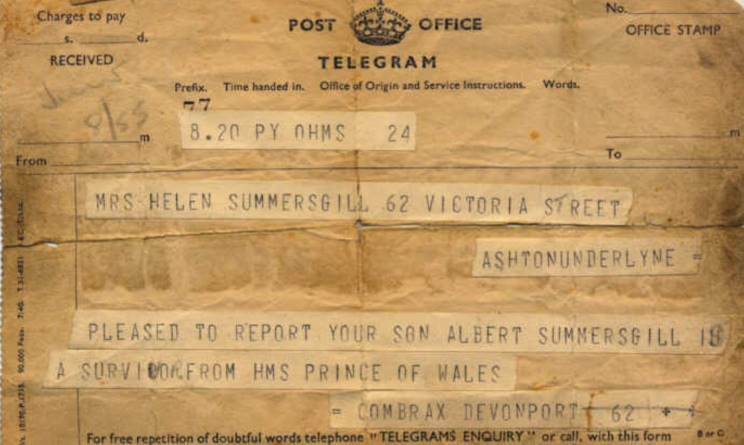 Dad was originally from plymouth and his father and two brothers were all Royal Marines out of Devonport. 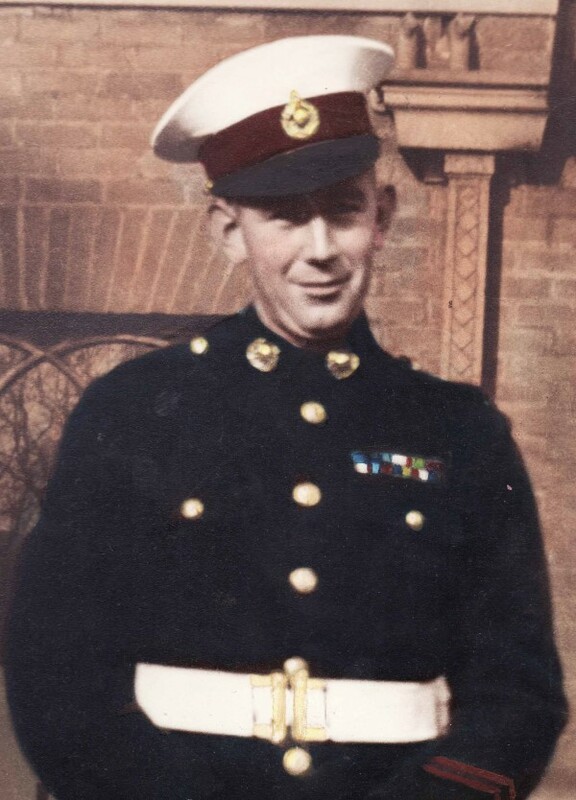 My father, John Victor O'shaughnessy Ply x 2593 Marine Detachment From. HMS Prince. Of Wales and Plymouth Argiles, escaped from Singapore on HMS Grasshopper. He will be 96. this year. Are there any other survivors still alive from Prince of Wales detachment Marines who escaped? He was on X-Turret. In reference to the P.O.W. the picture of captioned Prince of Wales seen burning is wrong. She is making smoke after being severely damaged. A shell passed through her bridge without exploding but hit the binnacle scattering metal parts which caused the damage. In reference to the men who returned '900 were packed into the Erinpura which sailed for Colombo on 21 December." - Martin Middlebrook and Patrick Mahoney - Battleship - The Loss of the Prince of Wales and the Repulse. - Excellent book. My father who was returning to England from Durban was put in charge of some of the seaman boys off of the POW and recounted how some were still suffering from trauma as they in compartments below where water got in. God knows how they got out. Hope that this is some use. My Father, Marine Douglas H. S. Hall, also known as 'Knobby Hall' survived the sinking of the Prince of Wales to become a PoW on Sumatra. His action station on board the Prince of Wales was Port side Mess Deck No 24. Would anyone know exactly where this was on board ship. Would anyone remember my Father. My grandfather, Marine Charles Samuel Henry Webb, was on the Prince of Wales when it was sunk by the Japanese. He survived the sinking and was not a Prisoner of War. He died in 1961 and I never found out how he got back to this country. I have been tracing my family history and I know that he was born in 1902 in Plymouth and joined the Marines in 1921. I would love to know how he got back here in about 1942. I live in Plymouth but there is no one that I can ask in the family. I am researching my family genecology and came across your site. My cousin Edwin Charles Ashton, was one of the causalities on the Prince of Wales. it was hard reading some of the history of the ship. There is to be a service on the 10th December 2011 to commemorate the tragic loss of life seventy years ago when the Prince of Wales and the Repulse were sunk. Please see the press release below. My interest is that my father Jack Farrer was on board the Repulse surviving the sinking and the war. There are few survivors still alive and we would like to publicise the event as it probably our last chance to honour them. If you require any further information please contact me. Press Release The 10th December 2011 marks the 70th anniversary of the sinking of the battleship HMS Prince of Wales and the battlecruiser HMS Repulse in the South China Sea. In 1941 a powerful naval squadron known as Force Z was sent to Singapore to act as a deterrent to Japanese expansion in South East Asia. This consisted of the two capital ships and four destroyers. Crucially, the new aircraft carrier HMS Indomitable that was detailed to join Force Z had been damaged after running aground and never joined the squadron. Just days after the Japanese attack on Pearl Harbour that brought the United States into the war Force Z sailed from Singapore with orders to intercept and destroy the Japanese invasion fleet that was landing on the Malayan and Siamese coasts. Following their sighting by a Japanese submarine and reconnaissance aircraft a large force of 34 high-level bombers and 51 torpedo bombers attacked the two capital ships. A fierce battle ensued but within eighty five minutes the lightly armoured Repulse had sunk following one bomb hit and numerous torpedo hits and a further forty eight minutes later the Prince of Wales also sank having been crippled by a first torpedo hit and subsequent torpedo and bomb strikes. The death toll was appalling; on board Repulse 513 of the 1309 crew died and on the Prince of Wales 327 of the 1612 crew. The survivors were picked up by destroyers and taken back to Singapore. To commemorate those who lost their lives the Force Z Survivors Association is to dedicate a memorial on the 10th December 2011 at the National Memorial Arboretum at Alrewas in Staffordshire DE13 7AR. The memorial is to cost £12,000 of which £10,000 has already been raised. Contributions can be sent to the Association Secretary Hannah Rickard at 19 Crossways South Croydon CR2 8JP. During a recent visit to Singapore in company with the Seletar RAF Association as a guest of one of its members, we visited the Naval Base at Sembawang. Within its boundaries is a memorial to H.M. Ships Repulse and Prince of Wales, a fact of which you are no doubt aware. As a young lad I remember being very upset when hearing of their sinking by the Japanese with the loss of over 1300 sailors. All these years later, I found it a very emotional experience especially as there was not even a spray of poppies in remembrance of them. The RAF visitors said a few words and left a small plant at the base. I deeply regretted that I had not had the foresight, as the only RN rating present, to have tried to obtain at least a wreath. I enclose a small photograph of the Plaque and hope that it will trigger off a reminder of their terrible fate, all due to the lack of air cover. At my request Sub-Lieutenant Dale Eyers has undertaken to obtain a wreath of poppies if possible to place on the memorial. I have suggested that it will be presented on behalf of the 8th Destroyer Flotilla which was comprised of the following ships; Comus, Cossack, Consort, Concord, Constance and Cockade. All these ships spent most of their working life in the Far East Station and would have sailed in the area of Kuantan many times. 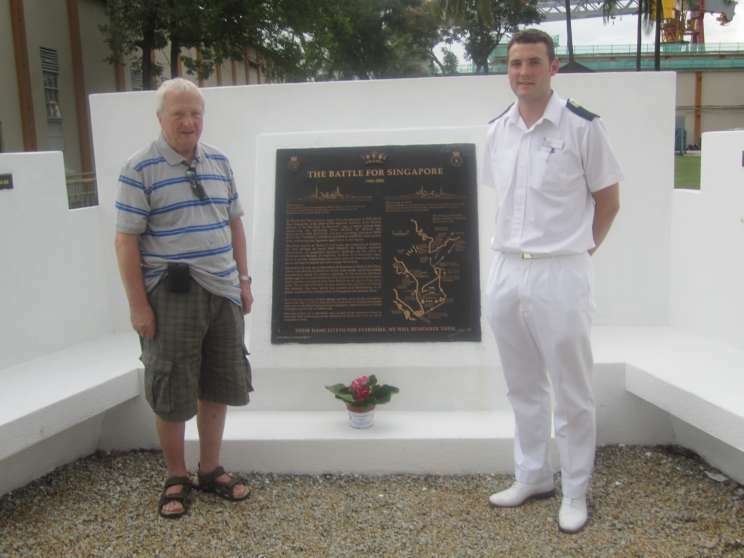 Derek Hodgson (left) and Sub Lieutenant Dale Eyers, Assistant Royal Naval Liaison Officer seen in front of the Battle For Singapore Memorial. In World War Two (1939 to 1945), this site was part of HM Naval Base Singapore , a key part of the regional defences of the British Empire in the Far East . In December 1941 a newly arrived fleet comprising the battleship HMS PRINCE OF WALES, the battlecruiser, HMS REPULSE, and four escorting destroyers HMS ELECTRA, TENEDOS, EXPRESS and HMAS VAMPIRE were tasked with countering any Japanese aggression in the region. This fleet, known as ‘Force Z' and under the command of Admiral Sir Tom Phillips on board HMS PRINCE OF WALES, received information of suspected Japanese landings on the coast of Thailand and Malaya . In response, at dusk on 8 December 1941, Force Z quietly sailed from near where you are now standing in a brave attempt to search out and engage the enemy. Around 11.00 a.m. on 10 December off Kuantan in Malaya the force, which was devoid of allied air cover, came under attack by enemy aircraft as a result of a chance sighting. In the ensuing two-hour battle against an overwhelming force of some 83 Japanese bombers and torpedo-carrying aircraft, both British naval capital ships were sunk. Of a combined total of 2921 sailors, 840 perished including the Admiral. The loss, which was sudden and devastating in its effect, hastened the eventual fall of Singapore two months later. In everlasting memory of their valiant sacrifice, given freely and against impossible odds so that we may now live in freedom. 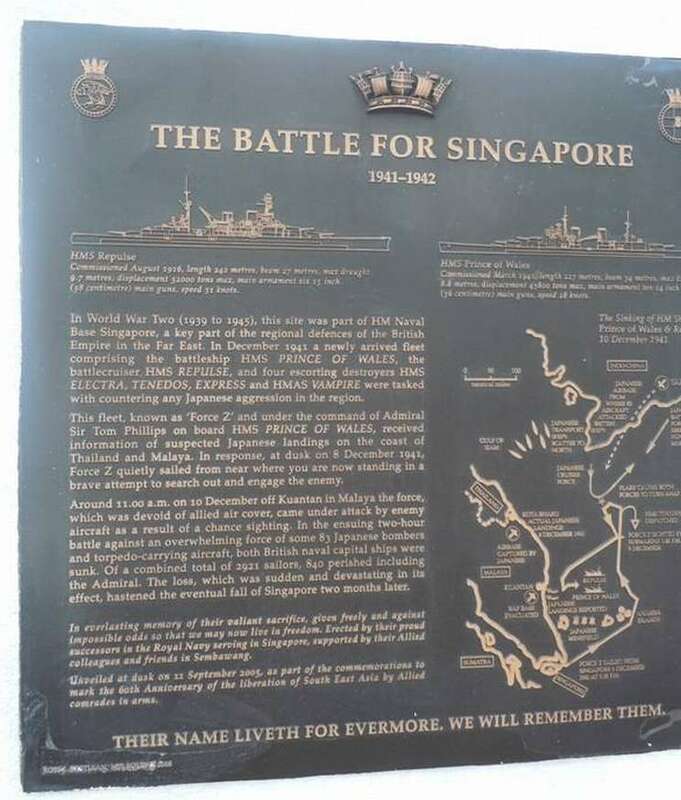 Erected by their proud successors in the Royal Navy serving in Singapore , supported by their Allied colleagues and friends in Sembawang. Unveiled at dusk on 11 September 2005, as part of the commemoration to mark the 60th Anniversary of the liberation of South East Asia by Allied comrades in arms. His memorial is listed on the Plymouth Naval Memorial, Panel 101, Column 2. However, on the CWGC website he is listed on HMS Sultan. I've looked into this and found that this was the name of the naval base in Singapore during the war. Do you think that he could have been transferred to the naval base? Or was it a case of listing the ratings that survived the lost of the ship but were themselves then lost during the land battle? I would be grateful if you could give me some advice on where I could do some further research to establish if this was indeed my uncle. His parents were George Millar and Mary Elizabeth McHenry from Belfast, Northern Ireland. As I live in France it's not easy to visit the national archives in Kew and have to do all my researching on the internet. Thank you for this great and only recently discovered site. As a child, I well remember a good friend, Leading Telegraphist Jack Ainscough, HMS Prince of Wales, who visited our family in Wigan. I remember hearing on the BBC news the announcement that the Prince of Wales and Repulse had been sunk. My father had to tell Jack's wife, Marie, that her husband was probably lost. They had been married only six months. I was only eight at the time, but I will never forget that awful day. Marie, incidentally, had just written to Roy Rich (BBC) requesting a record be played on his 'Forces Favourites' programme for Jack and his mates. I have British ancestry and I am trying to find reference to a relative of mine that served aboard the HMS Prince of Wales. He was a cousin of my father - John William (Jack) Lamden of Stettler, Alberta, Canada. I don't know the man's last name. There are no Lamdens shown on the ships crew list and I don't know what position he had on the ship. My father, who has passed away, once told me that his cousin had sent notification that he was shipping out on the Prince of Wales and that the expected port of destiny was to be Vancouver. His plan was to cross the Rockies via train and visit my folks in Alberta on shore leave while in Vancouver. They didn't go to Vancouver of course but went to the far east and my Dad's cousin did not survive. I am wondering if anyone might know the man's name and any other details - where he was from, date of birth etc. to help fill in a gap in our ancestry. 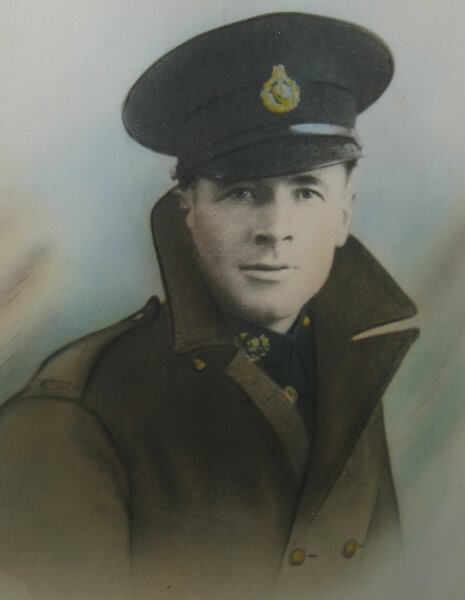 My grandfather, also named John Lamden, was from London and served in the British Army during the Boer War before moving to Montreal where he married Mary Jane Doak (Doke?) of Belfast. They then moved to Alberta and homesteaded on the land on which I grew up. I don't know if this information will help but I would like to satisfy my curiosity. I wondered if you could help me. I am looking for original ship's plans of HMS Prince of Wales and HMS Repulse. Would you have any idea where I could get them? I tried the National maritime museum in London but without luck. b) No one took any notice of General Smuts who gave warning of the Japanese ability and strength to both Churchill when he visited the War Cabinet and Admiral Tom Phillips when the latter visited him in SA and later when Smuts addressed the crew of the Repulse in Durban warning them what they should expect. d) That this was the beginning of the end of the British Empire. One can only hope, albeit with tongue in cheek, that our present day politicians will take heed of history and have the interests of their people to heart more than self and party interests otherwise we are in for a lot of trouble in the near future. "Someone had Blundered" by Bernard Ash. My father, Douglas Bert Worrall, was a Royal Marine who served on the Prince of Wales. He was born 7 August 1920 Wolverhampton Bristol. He also served on King George V and Vangurd 1947. I am trying to find as much information as I can. He left his ship at the end of the war in Cape Town, South Africa, was killed in a car accident 1968. I would be so grateful for anyone's help. be any record of this. can shed any light on where records might be found I would appreciate it. Can anyone tell me the colours HMS POW was painted during its engagement with the Bismarck and Prinz Eugen in the Denmark Strait I have the tamiya kit and the colours given are tamiya colours not the actual Royal Navy colour designations. Black & white photos vary in contrast so it is impossible to tell whether the hull and superstructure are Light Admiralty gray, Medium or dark admiralty gray. My Grandfather was a Royal Marine (PLY X 878) who served on the Prince of Wales and survived the sinking and managed to make it back to the UK. My Grandfathers name was Thomas William Bromfield and he joined the Marines in 1932, he also served on HMS Furious, HMS Queen Elizabeth, HMS Rodney and HMS Superb, I know he was a gunner and worked in Y turret on the Prince of Wales. Granddad survived the war and finished with the Marines in 1953, (after 21 years). The family (Granddad, Grandma, my father and his two brothers emigrated to Melbourne Australia in 1958, Tom Bromfield passed away June 1980 aged 68. My father served on HMS Prince of Wales and survived only to be captured by the Japanese and imprisoned in the Far East until the end of the war. My dad was a wonderful man and didn't talk openly about the horrors he and his fellow internees suffered under the hands of the Japanese but he did talk affectionately of his beloved ship HMS Prince of Wales. He was on board when the battle took place with the Bismarck but they were damaged and had to find a port for repairs. He was also there on the fateful day that the Prince of Wales and the Repulse sank, December 10th 1941. I cannot recollect which ship picked him up but I did hear him talk about the Hung Jua (if my spelling is correct). This also went down and he ended up in the hands of the Japanese. There is so much I would love to know but there are so many pieces missing just like a jigsaw. He was born February 1921 and I do know that he said on his 21st birthday he was on a raft in the middle of the ocean. Whether that was when he was on the Hung Jao I do not know. Sadly he died in 2003 at the age of 82, his name was Frederick Lawrence Kettle (lol) or (Taffy) and he lived in North Wales. I am the granddaughter of Cornelius Donoghue (also known as Steve) who served on HMS Prince of Wales. I am interested to find out any information about his time in the navy, particularly if anybody remembers him. 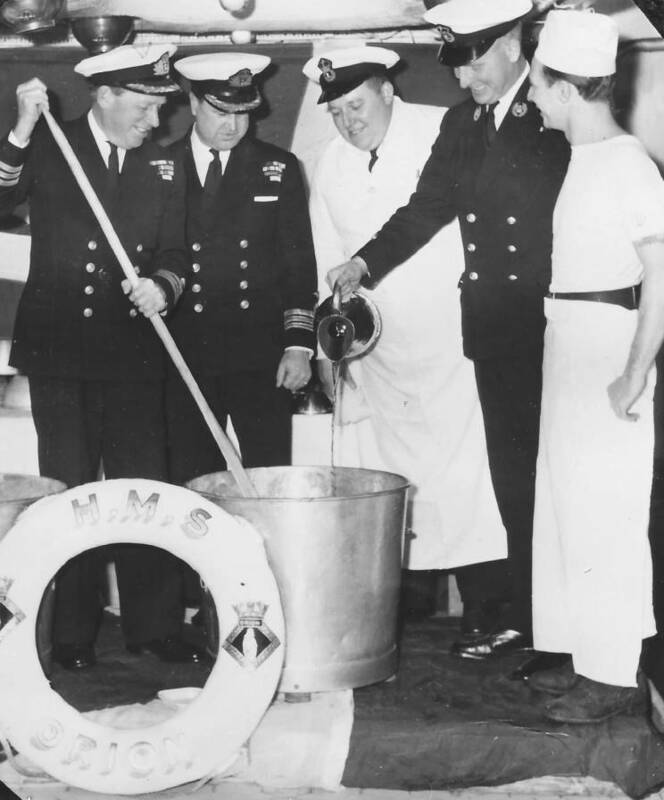 He did attend the Naval reunions until his illness and unfortunate death in August 2005. I would be so grateful for anyone's help. To post a message, comment or reply please email the webmaster. All replies will be forwarded to the original sender.